A husband was arrested by the police after he shot a male doctor for touching his wife during childbirth. The man had wanted a female doctor to supervise the process as he obviously couldn’t stand another man seeing his wife’s nakedness, Gulf News reports. It was gathered that the suspect’s wife went into labour and checked herself into the King Fahad Medical City in Riyadh in Saudi Arabia. The male doctor on duty, Dr. Muhannad Al Zabn, helped the woman deliver her baby but her husband wasn’t pleased when he heard the news. The suspect asked to meet the doctor outside of the hospital so he would thank him and show his appreciation in person for his assistance in the delivery, but the reverse became the case as he pulled the trigger when the doctor came outside. Dr. Al Zabn was said to have sustained serious injuries from the encounter while the man took to his heels immediately after committing the act. 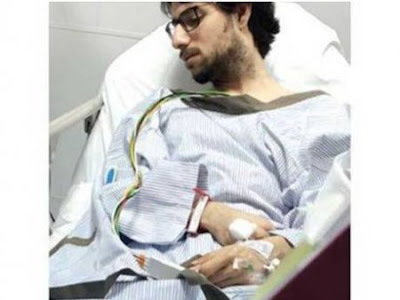 However, the police trailed and arrested him while Dr. Al Zabn was transferred to the intensive care unit of the hospital. The spokesperson for the King Fahad Medical City hospital, Bassam Al Buraikan, confirmed the incident adding that t Dr. Al Zabn is now in a stable condition.